Our unique traditional stone building makes a wonderful atmosphere where you can relax after a hard day adventure. With our welcoming home atmosphere, and cafe’s and traditional taverns, Host El Greco is the place youʼre sure to find hard to leave! Clean bed linen! Cafe’s, Greek traditional taverns, Greek traditional dances! Barbecues at night! Rent bikes and motorbikes! There are secure facilities, and much more… Interested? Rock climbing! Quality, affordable accommodation, superbly located under the Holly Rocks of Meteora, the most beautiful part of the city. Youth Hostel El Greco at 5 Sidirodromou Street, is located in the center of the Kalambaka City, just 3 minutes walk from train station or bus station! We offer 4 bedded dorms with private bathrooms.We offer towels for free. You always enjoy clean bed linen and fans in the rooms. There is Free Internet at 24 Mbps in all of the rooms, 24 hour access to the hostel after you check in. Great hostel! I enjoyed my stay here a lot, the staff is very friendly, the tours they offer are amazing and it's located close to the station and the center, yet the monasteries are only a short walk away :D Would definitely recommend and go there again! Very lovely hostel, comfortable beds, super friendly stuff, delicious breakfast and such a welcomeing atmosphere. We loved our stay there! El Greco is an awesome place to stay! Especially if you want to go hiking in that are! It's just a 45 minutes walk to the first monastery of meteora. Also Mama Dora (the owner of the hostel) is one of the kindest persons I've ever met! She keeps the whole place clean, speaks very good english and can give you a lot of advice what to do around there. I stayed in El Greco for the Easter weekend and she cooked a meal for everybody! Also the neighbours invited us for some lamb! Had a great time! We had a great stay at El Greco Hostel. The local host Dimitri was very helpful with everything. 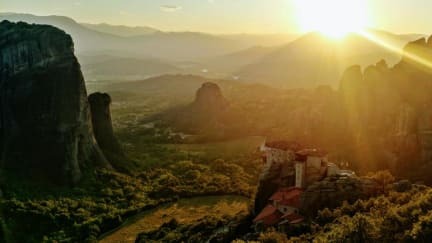 He makes a 3-4h walking tour to the rocks of Meteora on tip. The tour was informative and interesting, because Dimitri knows all about the area. The kitchen has everything you need and it is clean. We would stay there anytime again! Dora, die Hostelbesitzerin, ist eine sehr nette, kontaktfreudige Person. Sie gibt gerne viele Tipps und sprudelt vor Energie. Man kann bei Wanderungen vom Hostel aus mitgehen. Die Küche befindet sich außen, wo auch das Frühstück stattfindet. Das Frühstück ist auf den ersten Blick eher unkonventionell, aber man wird für wenig Geld satt. Wir hatten es nicht schwer Leute kennenzulernen, da Dora uns gleich mit anderen Reisenden bekannt gemacht hat und man so schnell ins Gespräch kam. Super Gastgeber. Tägliche Wanderung zu den Klöstern. Einfache und saubere Ausstattung. The beds and bathrooms are better in the other hostel I stayed in in Meteora, BUT El Greco has the better atmosphere, it is more family-like, the staff is awesome and extremely caring and helpful! Dont miss out on homecooked greek dinners, advises on where to go and the offered guided tour off the beaten tracks in Meteora! Very cool staff and very well fitted to meet people as there is a small common terace where everyone hangs out. As well nice, cheap breakfast. However, I can't really recommend it. The rooms are cleaned every day, but there were BED BUGS. 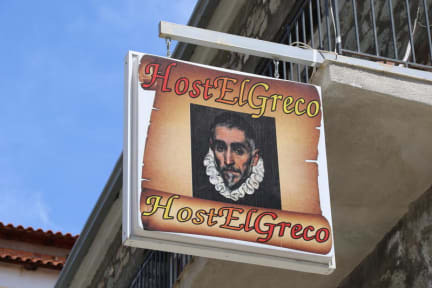 I stayed at El Greco one night. For that it was ok, but I wouldn’t want to spend more time there. They were fully booked, so I slept on a pull-out-chair and didn’t get a locker. People were nice enough but there was no real atmosphere there.